DYMO LabelWriter Shipping Labels, White, 2-5/16" x 4"
Connect the printer. Ensure the printer prints successfully from the software. With the printer connected, open Breeze in a browser. Create a new event and select the checkbox relating to printing name tags (see Event Settings for more details). Open the check in page for the event and check a person in. The first time you load the check in page the browser will ask for permission to access the DYMO Label Framework. Grant it permission (you won't need to do this again). The printer should print the name tag automatically when you check the person in. We recommend using our printer connection tester to ensure that your printer is set up correctly. 1 Note that previous versions may not work on all browsers, specifically Chrome and Edge. 2 Computer running Windows XP will not be able to install a compatible version of DYMO Label Software. 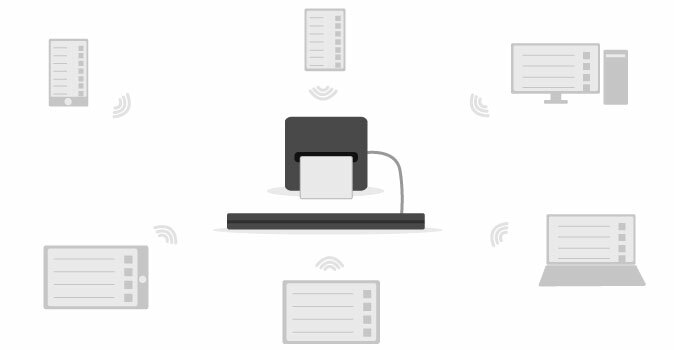 Breeze allows you to print to a computer-connected printer from any device that has a web browser. This includes iPhones, iPads, Android tablets, Android phones, Kindles, Nooks, laptops, desktops, and more. 1 You can run multiple print stations at the same time. 2 Ensure the event's settings are set to print out a name tag. 3 If the list does not automatically appear, click the gear icon on the top of the check in page and select "Printers". We recommend using the Brother QL-820NWB as the AirPrint compatible printer with the Breeze Check In App. Hope to one day be able to connect to a iphone/ipad via lightening to USB and print directly from there. followed all the steps. When I check someone, it defaults to the print page on the ipad I’m using for check in. Am I missing a step in the setup process? . . . Don’t think so b/c all of the above steps worked just fine but maybe. Could be a setting on the ipad itself that messes things up but can’t find anything. Second question . . . can one computer be used to support multiple printers? Hey jscott - I'm sorry about the troubles. I know from personal experience that getting the printer off the ground for the first time can be a huge pain. If you've made the printer a print station from the computer, when you go to the check in page on the iPad it should popup a window asking which printer you'd like to go to. Is that not happening for you? I've found it helpful to load the event from my computer, click check in, then select the printer and click the "make print station" directly from the event check in page and then using the iPad from there - I've found that it picks up the print station a little better. However, if you try those tips and it's still not helping, please Contact our Support Team and we'd love to walk you through some extra steps and possibly set up a screen share with you so that we can get to the bottom of it! For your second question - yes. You can plug in as many printers as you have USB ports. However each external device (iPad) can only connect to one print station. So if you have 3 printers, and 3 iPads, each iPad will have a designated printer to go to. We’ve got an Epson Printer that’s served well for 4 years, use the scanner rarely but the quality is astounding. if the Epson Repair Center is the good choice provided to the customer, Along with Multi pack and XL cartridges, the price per print is low and it’s never failed to come up with the goods. There are any issues regarding help with 24/7 hours support. Is there a way to print from a tablet that has the breeze app and NO COMPUTER? If so, which printer do I need to do that? Does this have an android app? Hi Emily! I am getting ready to purchase everything necessary to get us up and running. I am torn between a laptop and a ipad. What do you recommend? Thanks! I would recommend a laptop! We have used both and you can use both for check-in or accessing the software, but if you are printing name tags,the computer needs to be involved in the equation for processing the name tag through the DYMO software. Because the software cannot be installed on phones or tablets, the computer is essential to being able to print wirelessly. However, the benefit to the wireless printer is that you can have your Print Station open on a computer in your office, tech booth, etc. and it will communicate over the wifi to the printer. This will give you the appearance that you are printing directly to the wireless printer with the computer out of sight. I keep getting this error "browser plug in in unable to connect". Anyone have any idea on this? Hey @morenoc3296 check out our article Printing Name Tags (Troubleshooting) - that may be able to help you figure out what's going wrong. If not, please Contact our Support Team and we'd be happy to do some troubleshooting steps with you! Do you have to make printers a print station every time you open the same event? Does it not retain the names you've given the printers? Are they not permanently Print Stations? Keeping the same printer with same check-in station every time will eliminate this. Even if you are using the same model of printer, different printers will cause your computer to create multiple print queues (which result in labels not actually being printed). If you have multiple stations, label your printers and keep the same printer with the same station every time. It's nice that you support the adhesive labels, but we'd like to be able to print the non-adhesive 2-1/4- by 4-1/5-inch badge labels (30856) as well. That way, on Sunday morning, new visitors will not be visibly "labeled" as being different from the rest of the congregation. Any chance of adding an additional format? At this time that is not a current feature within Breeze or on the roadmap at this time. We sincerely appreciate your thoughtfulness and your efforts in explaining where Breeze has room to grow. Know that your feedback is really helpful and lets us know what's most important to our churches as we create our next development roadmap. Our label printer (DYMO 450) will print all black labels every few weeks. We have to run the driver install and select repair. That seems to work for a week or 2 but then it happens again. At first I suspected windows updates had disrupted the driver somehow as it coincided with large windows updates, but this past Sunday nothing had been installed and again the labels were black. This time repair did not work and I had to remove the printer and install again. Anybody else had this issue? Currently this week it is working. I found a post by another church who use this same printer with different software. You should ensure the user account on the computer running the printer sever is an admin account during setup. Install or repair divers while that account is admin. Once setup you can change the account back to a normal user and it should still work, this was my experience. I am wanting to print check-in labels without the need of my printer having to be connected to a computer. We will have an ipad that we will be using for check-in. I am going to order the wireless label printer from DYMO. Will this allow me to print labels without having to have a computer right beside the printer? Hey Justin! Thanks for letting us know about those black labels - we definitely don't want that to keep happening! It's possible those Windows Updates were related in some capacity but that additional information makes me ponder that. Please don't hesitate to give us a ring (or shoot us an email) if that happens again and we'll troubleshoot with you to ensure that doesn't keep happening! Sarah - excellent question! While the Wireless Dymo printer doesn't need to be near the computer to work, it would still need to be on the same network as the computer. The computer itself would also need to be set-up with the Print Station turned on for the event. Then you should be good to go! Feel free to give our team a ring as well and we would be honored to walk you through those steps! We love to serve! Is there a way to see how the label print out would look like prior to it printing on the dymo label printer? I can't seem to see what it would look like prior to the automatic print out setting? Will it ever be compatible with the brother label printer? This may be most helpful on setting up your label so that you could gain an idea of what it would look like when it prints. If you are wanting to use a brother printer: Check out the unofficially supported Air Print Check In iOS app. Note that to use the unofficially supported app, it requires a wireless Brother Printer. Started just with my Mac, and downloaded the software. However, every time I log back on to my Mac to print, I get an error message that the software is not downloaded (Which it has... several times). Anyone else have issues printing from a mac? Then, I thought we might be able to use a Chromebook. Only to find out that the dymo printer software is not supported on the Chrome OS- just confirming that Chromebooks will NOT work with the printers? Last, we purchased a basic laptop, it is fine and seems to work each time we log on, but I am wondering if anyone has a device that is not too expensive that works well. Want to find the best option out there. Thank you!